This is required for all CCP students every year. If you are a public school student, meet with your Guidance Counselor to submit your Letter of Intent form. If you are a nonpublic school student or a home-school student, your Letter of Intent should be submitted to the State of Ohio, and the State’s CCP funding application should be completed by their listed deadlines. Please do not use your school email address when applying. Many schools block email sent from North Central State and as a result, you may miss important emails from us regarding your acceptance status and enrollment process. Qualifying scores for ACCUPLACER and ACT can be located here. Specialized Accommodations: If you have a documented disability and qualify for accommodations, you will need to contact the Office of Specialized Support Services to make arrangements to use accommodations during testing.Please contact Doug Heestand, the Coordinator of Specialized Support Services, at 419-755-4727 or dheestand@ncstatecollege.edu. Taking courses only at your high school or career center? 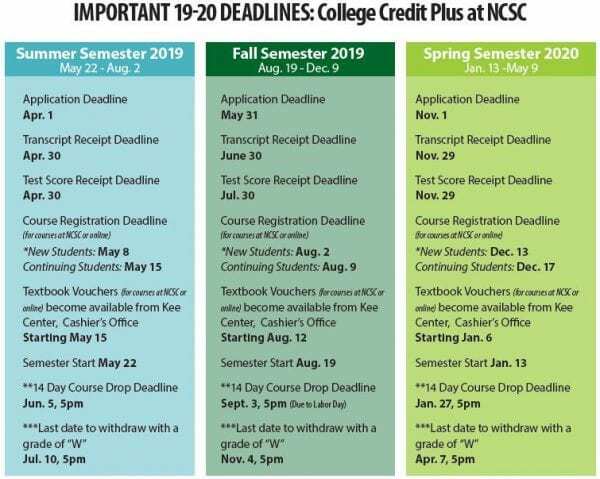 Taking any courses on NC State’s campus or online?